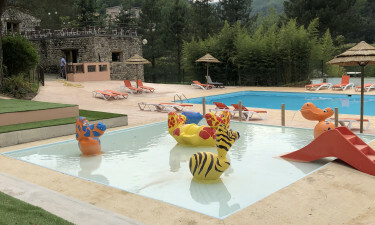 For families and travellers looking for a relaxing stay in the heart of the stunning Ardèche countryside, choose Mas de Champel for your next camping holiday with LuxCamp. 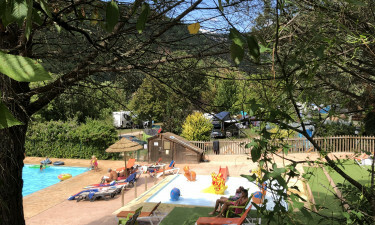 Nestled within forests, beside lakes and among the gentle hills of the Monts d'Ardèche Natural Regional Park, this luxury camping site takes you to the heart of nature, with well-maintained grounds and facilities for all ages. Mas de Champel is a nature lover’s dream, ideal for families looking for a relaxing escape or adventurous travellers seeking an active holiday with canoeing, forest treks and cycle routes through beautiful countryside. With secluded mobile home pitches, Mas de Champel has everything you could need right on site, from sports and games to spa and wellness rooms. The water park consists of a gorgeous, heated swimming pool with shallow paddling zones for little ones. Games and activities are held beside and within the pool each day, and the poolside terrace features sun loungers for basking in the heat. 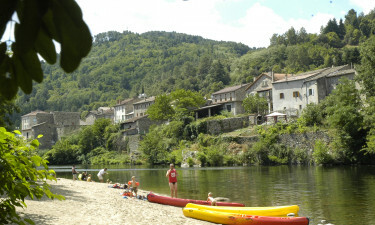 The Eyrieux river is directly accessible from the camp, with a private sandy beach for holidaymakers at Mas de Champel. Lakeside walks, cycle trips and canoe hire are ideal ways to enjoy this tributary of the famed Rhône.